Ramen Champion (“RC”) is a multi-brand ramen concept brought to Singapore by Komars Group that sources popular ramen brands from Japan and invite them to compete in the annual competition for the prestigious “The Ultimate Ramen Champion”. Their latest outlet after Bugis and Changi Airport Terminal 3 is located at Great World City. Following their concept, each outlet will have different brand of ramen with their own unique taste, flavour and personality of ramen. The outlet in Great World City is represented by Bishamon Zero (existing brand), Tonkotsu Itto (existing RC competitor), Miyamoto and Butaou (new RC competitor). The opening of this outlet was kick start with inaugural Ramen Big Eater Challenge, with the presence of celebrity competitive eater from Japan, Miss Tomoko Miyake. I saw her on a variety show, and it seems that she has a stretchable stomach and gigantic appetite. So without a doubt, she was the winner of the eating challenge. If you got time, you should check her out online, you'll envy her ability to eat so much and stay in shape. "Ramen Big Eater Challange "
We begin this ramen adventure with Bishamon Zero's Sapporo Miso Special Ramen ($14.80). Originated from Sapporo, the broth is cloudy, robust filled miso texture. The ramen has a medium thickness, springy (qq) and tasty. The pork belly Cha Shu is tender and does not overwhelmed with its fattiness. The egg is cooked to perfection. In the soup, there is mild chilli flavour with subtle spiciness to give the warmness in the ramen. Tonkatsu Itto's Special Tonkotsu Ramen ($16.50) from Tokyo follow next. The ramen size is very thin, similar to Angel hair pasta size. It is springy, not very flavourful, but carry the broth well. The pork base soup is robust and full of collagen taste from part of the pork bones. The egg is cooked nicely with the soft yolk in the middle. The cha shu is tender, however it is tasteless. You might want to eat it while its hot, or you will be overwhelmed by the richness of the broth. Narita's City Miyamoto's Pork and Vegetable Ramen ($16). Once we saw the bowl, we decided to named it Army Boys Ramen, due to its humongous size. It seems the chef is throwing everything except for the kitchen sink in this dish. The noodle size is pretty big, similar to Mee Pok, but thicker and very resilient. The broth is difficult to spot as it is basically buried under the the layers of ramen, bean sprouts, sliced cabbage, cha shu and diced pork. Once you get through the layers above, you can taste milky robust broth with a strong garlic presence. The half boiled egg here serve in full, as it is slightly under cook compare to the previous two ramens, the yolk just ooze out when you poke the egg. The cha shu is tender and flavourful, but I find the most tasty and tender part is the diced pork. Little Devil ('LD') and I feels that this bowl can easily filled two person. The last bowl of ramen that we tried was Butaou's Special Sukiyaki Ramen ($16). Originated from Saitama Prefecture in Tokyo and inspired by Sukiyaki, the broth of this ramen originated its taste from sukiyaki sauce. The broth is robust and sweet, while the ramen is thin and springy. The egg was slow boiled with the yolk ooze out as soon as we break it. The cha shu is the tender, flavourful and the tastiest of all ramen, and the shabu-shabu style pork is just tender. Something different, but take a lot to get used to due the sukiyaki soup base and it will be a favourite to those who love sweet soup. For the sides, we tried Okonomiyaki Gyoza with bonito flakes ($5.80 for 5 pcs) and Mentaiko Gyoza ($5.80 for 5 pcs). The gyoza are tasty with a combination of crispy skin and juicy fillings. We prefer the Okonomiyaki gyoza as the combination of bonito flakes and the sauce create a more flavourful gyoza. The Mentaiko sauce, seems to lack the punch, it can do better with stronger taste with extra mentaiko mayonnaise or mentaiko toppings. Tori Karaage ($4.80) is quite delicious. Crispy on the outside, with well seasoned juicy succulent chicken thigh meat inside. While Spicy Chicken ($5 for 3 pcs) is quite ordinary. It lacks of seasoning, crispiness or even spiciness. The meat is tender, but it seems lacking in the obvious seasoning. 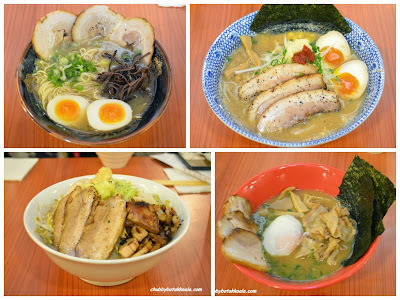 Overall, we find the Ramen served in Ramen Champion does have a certain standard. It is very difficult to decide which as are the best as individual preference and taste can be different. For LD's and mine, we decided that Bishamon Zero's Sapporo Miso Special Ramen as our 1st preference followed by Tonkatsu Itto's Special Tonkotsu Ramen. Why don't you give it a try and let us know which ramen you like. Kanpai!!! Cheers!!! Thanks to Malcom and Ramen Champion Team for the tasting invitation. For other branches, check out their website.